The asteroid that is thought to have killed the dinosaurs was the size of Manhattan and smashed into the earth just off the Yucatan Peninsula in Mexico 65 million years ago. The resulting unleashed energy killed 90 percent of life on the planet. Things are a little calmer now in this part of Mexico—the days, the region is more threatened by overdevelopment, tourists, and renegade oil slicks. However, the geological changes wrought by the killer asteroid remains in the form of sinkholes, or cenotes, that formed around the impact crater. 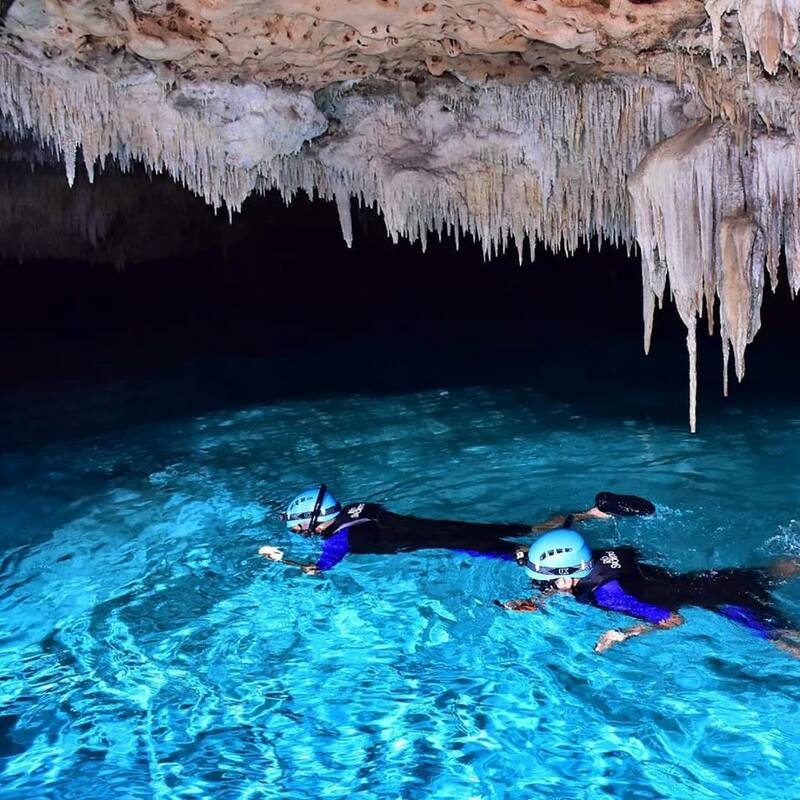 Rio Secreto is a tourist attraction in the Riviera Maya that thrills visitors with a visit to a natural underground river and the limestone cavern system it winds through. Discovered in 2007, the cave is part of a 7.5-mile long network that is still being explored and mapped. Most underground river networks such as these are limited to trained spelunkers since there are sections completely underwater that require diving equipment. Rio Secreto, however, can be experienced on foot in a few hours—with no swimming experience required—and enjoyed by all ages. Located about 10 minutes south of Playa del Carmen on Cancun-Tulum Federal Highway 307, the entrance to Rio Secreto is a drop-off area for buses and hotel shuttles. A 20-minute van ride down a bumpy jungle road brings you to the cave itself. Here, you are greeted by your guide (ours was named Moses), fitted for safety equipment, and asked to shower before entering the caves. (Rio Secreto is a local drinking-water source, so and showering off suntan oil, makeup, etc., guarantees that the cave and river water remain pristine.) All guests are then fitted with a wetsuit, helmet with light, water shoes, and life vest and lockers are provided for your valuables. The entire experience lasts about 90 minutes, and a second guide will accompany you as a safety precaution and to take photos of your group. Some natural agility and sure-footedness comes in handy as you are wading in and out of pools of water along slippery rocks, and dodging low ceilings and stalactites that could ring your bell (hence the helmets). There is a short portion of the tour where you are floating and treading water in a deeper pool—some swimming ability is helpful, although not strictly required, in this segment. One of the more interesting parts of the Rio Secreto experience came when we were resting on some rocks after the deep-water portion of the tour. Moses asked us to turn out our helmet lights, and and we immediately found ourselves in total darkness for a few minutes. The sound of water dripping from the ceiling and your own heartbeat in the pitch blackness and stillness of the cave makes you really appreciate the invention of the flashlight and a guide who can find his way out of the cave. There are strategic points along the route that are set up for individual photo shots. Since this is a cave with no natural lighting, the folks at Rio Secreto have set up a system of lights for flash photography that yields excellent results. At the end of the tour, you are given a chance to view and select photos of your excursion, served a light meal from the snack bar, and given a chance to unwind before the bumpy trip back. It’s not often you get to experience a place where so few have gone, and so few have seen. Millions of years in the making, Rio Secreto lets you appreciate natural wonders forged by Mother Earth—and a wayward mountain of space rock.